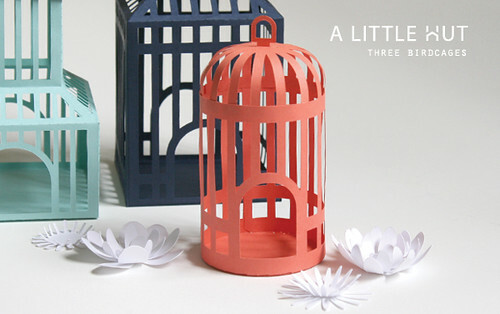 So here is the new Three Birdcages set! There are two different styles (round and square) and as always you can make them as simple or embellished as you'd like. The SVG and DXF files are obviously included—and by popular demand (already!) I've included PDF files for those of you that would like to to make them by hand. In all honesty cutting them my hand shouldn't be too much trouble. 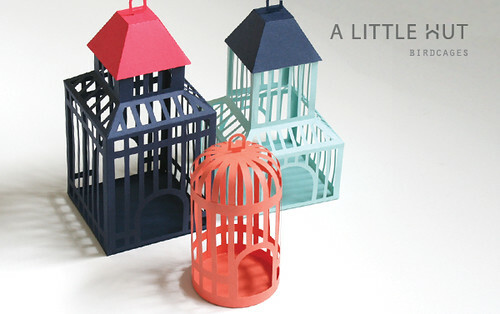 Aside from the bases of the round birdcage almost all the lines that need to be cut are straight—just print the pages, grab a ruler and an Xacto and you'll be ready to go. I have to say that I'm really enjoying working on these 3D projects. They are a lot of fun to make. I always feel so relaxed when I'm putting projects like this together. It really is like therapy. In order to celebrate that it's National Craft Month from March 7th to March 12th there is a 20% discount on all items of the shop. Use the code craft2012 and make sure to add it to the Shopping Cart page (the link is one of four on the top right side of the site).